The acquittal today of J20 protesters and journalists is a major win. But civil liberties and press freedoms are still under threat in the US. A reporter convicted for filming a political rally. A journalist arrested for asking a politician a question. Journalists facing decades in prison for being in proximity to an event they were reporting on. No, it’s not Egypt, Russia, Turkey, or another authoritarian state. It’s the United States in 2017. Since the election of Trump, there’s been much ink spilled and hair pulled out at the legitimate concern over whether an authoritarian, censorious figure like Trump could silence free speech and the free press as part of a dictatorial power grab. But if fascist authoritarianism ever comes to the United States, it won’t be due to the seizure of power by a single individual. It’ll be through the many small, little-noticed, and incremental actions taken by obscure and relatively unremarkable figures in positions of authority who would never consider themselves enablers of tyranny. There’s no better example of this than the just-completed trial of the so-called J20 protesters — the men and women who attended the inauguration protest of Donald Trump earlier this year, where at one point a minority of attendees peeled off and started destroying property. Those arrested included peaceful protesters, bystanders, and, particularly alarming for press freedom, journalists covering the event. One of the defendants didn’t even attend the protest. The nine journalists arrested include independent photojournalist Alexei Wood, and Santa Fe Reporter staff writer Aaron Cantú, who has also written for The Intercept and the Baffler (charges against the other seven reporters were dropped). Mere hours ago, the first six of the J20 defendants to be tried were acquitted of all charges, in a victory for freedom of the press and protest. They had faced felony charges that could have led to up to fifty years in prison, a precedent that would have affected the nearly two hundred others who are yet to be tried. The defendants — including Wood, the journalist — had been charged with felony property destruction, misdemeanor rioting, and misdemeanor conspiracy to riot, even though none of them actually participated in any rioting or property destruction, a fact the prosecution acknowledged. “You don’t personally have to be the one that breaks the window to be guilty of rioting,” the prosecutor told the jury in her opening statement. The first of the J20 trials may not have ended with the snuffing out of basic First Amendment freedoms, but the case — in its basic premise, the argument of the prosecution, and the way it proceeded — is instructive for what it tells us about authoritarianism in the US context. The judge presiding over the case, Lynn Leibovitz, had engaged in a startling bit of legal analysis that the jury fortunately did not affirm.. Though throwing out one of the charges — that of “inciting a riot” — Leibovitz, according to the Real News, told the jury as they left to deliberate that “a reasonable juror could find that [Wood, the journalist,] was a principal and an aider and abettor of the riot” because he “played a role that furthered the purposes both of the conspiracy and of the riot itself, which was to advertise it, to broadcast it, to live-stream it such that other could be recruited to join in.” In other words, simply reporting on a crime meant that you were an accessory to crime. It may seem radical, but it’s hardly surprising given Leibovitz’s history. Back in 2006, Leibovitz sentenced then-eighteen-year-old anarchist graffiti artist John Tsombikos to a month in jail, two hundred hours of community service, and $12,000 in fines, after a spree of tagging “Borf”— a stencil of his dead friend’s face and nickname — on everything from walls and street signs to dumpsters and mailboxes. What was for Tsombikos an expression of anguish over his friend’s suicide was something very different for Leibovitz. Tsombikos, for his part, wasn’t contrite. According to a 2006 Washington City Paper profile of him, his work, which had started after his friend’s suicide, was meant to reflect the fact that “American culture values property more than people,” in which “every clean wall and every gentrified neighborhood” was “ an affront to his philosophy and to his friend’s memory.” Ironically, with her position in the J20 trial, Leibovitz may have inadvertently proved his point. He was right. Leibovitz, who said Tetaz’s actions “demeaned the action of protest,” sentenced her to twenty-five days in jail, a sentence that would extent to seventy-five days if she was arrested while on probation, which would last eighteen months. Leibovitz’s instructions to the jury in the J20 trial obviously represented a significant escalation relative to these earlier examples. But they belong to the same thread: that of skepticism toward First Amendment rights paired with outrage over property damage and the disruption of order. There’s currently a great deal of justified worry about Trump’s reshaping of the judiciary, which has seen him nominate both wholly unqualified bigots and longtime conservative activists to the bench. But the example of Leibovitz is instructive. For one, Leibovitz was a Bush appointee, part of an initial wave in the long-term conservative project of reshaping the judiciary through lower court appointments. In other words, the impulse to stifle basic freedoms doesn’t just come from right-wing cartoon characters. More often than not, it comes from innocuous authority figures like Leibovitz, “tough-on-crime” warriors with a soft-right tilt. This is no isolated example. 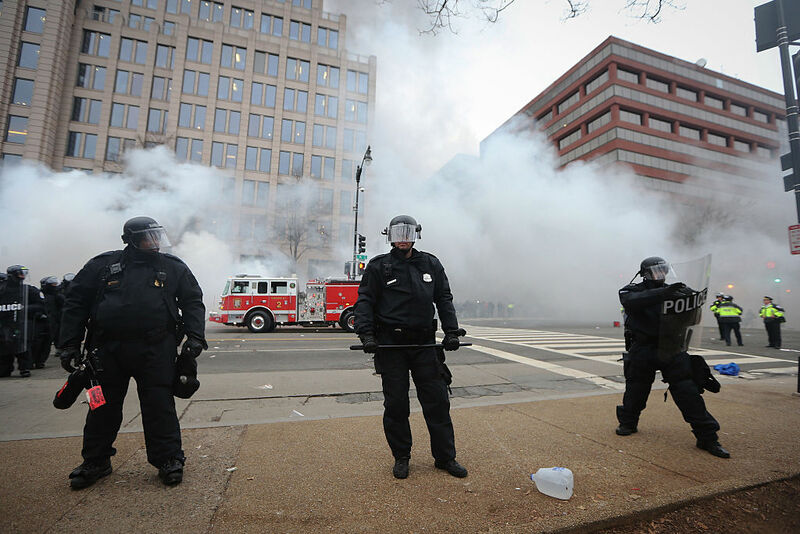 The past few years have seen repeated challenges to press freedom from relatively obscure authority figures, ones that are likely to continue despite the victory of the first six J20 arrestees today. Just this week, Iowa Supreme Court justice David Higgins issued a temporary stay against the Des Moines Register, prohibiting it from publishing information from legally obtained court records at the request of the local attorney they pertain to (the stay has since been lifted, which the attorney suggested was a result of media pressure). The move was roundly condemned by both press freedom advocates and the newspaper itself, which called it “an undesirable and unsustainable outlier in the law and policy of this state and this nation.” For some perspective, in 1971 the Supreme Court ruled that even the Nixon administration’s national security objections didn’t meet the “heavy burden” required to halt publication of the Pentagon Papers. Less than two weeks before that, citizen journalist Nydia Tisdale was found guilty of misdemeanor obstruction after filming a political rally, with the presiding judge sentencing her to forty hours of community service, twelve months’ probation, and slapping her with a $1,000 fine. Tisdale had been arrested in 2014 while attending and filming a Republican rally at a pumpkin farm in Georgia. She had been told to stop filming, and was then forcibly removed by a police officer whom Tisdale kicked and elbowed. Tisdale said she wasn’t aware he was a police officer — her video footage showed her repeatedly asking him to identify himself — and testified she felt “pain and terror” and like she was “being raped with [her] clothes on” as the officer pinned her against the counter and pushed his groin against her. The owner of the farm claimed Tisdale’s filming of the candidates’ speeches in the front row was “intimidating to speakers.” The prosecutor, assistant district attorney Conley Greer, argued that because the event was on private property, the owners had every right to decide what attendees were allowed to do. “If a person cannot be free on their property, to do with that property and control that property as they see fit, not as a politician sees fit, can they ever be free ever?” he asked jurors. This follows on a number of other high-profile incidents of heavy-handed law enforcement actions against journalists doing their job. Last May saw Public News Service West Virginia journalist Dan Heyman arrested and charged with “willful disruption of government processes” for repeatedly asking questions of Kellyanne Conway and Health and Human Services Secretary Tom Price as they were leaving a meeting on opioid addiction in West Virginia. The criminal complaint accused him of “aggressively breaching the secret service agents” and “causing a disturbance by yelling questions,” though the charges were later dropped. Before that, there was the arrest and charging of journalists covering last year’s #NoDAPL protests. The charges closely paralleled the current J20 trial, with at least one journalist facing up to forty-five years in prison if convicted of conspiracy and burglary. Although Democracy Now’s Amy Goodman saw her felony riot charges dropped, as did others, independent journalist Jenni Monet continues to face criminal charges. And before that, there were the Ferguson protests, during which at least two dozen journalists were arrested and one was convicted of “failure to comply,” circumstances that were repeated this September when at least ten journalists were arrested, often using excessive force, while covering protests over the acquittal of a former St. Louis police officer who murdered a black man. Or watch this video of no less than five police officers assaulting and arresting Shareblue reporter Mike Stark in October for having the temerity to film the campaign bus of Ed Gillespie, Virginia gubernatorial candidate, one of a number of incidents of hostility toward Stark from the campaign. The police destroyed Stark’s phone in the process of arresting him, and subsequently charged him with disorderly conduct and resisting arrest. One has to wonder if Stark filming Gillespie’s bus was really more disorderly than five men piling onto one as he screamed in pain. The local police chief defended his officers’ actions by explaining that the police were there to “provide security,” that Stark was “wearing a hooded sweatshirt,” and that police didn’t know whether he was there to “create harm or something else.” But Stark’s foremost offense, the officer seemed to suggest, was that Stark used “profanity” while “there were children and families at this event.” It was the police’s mission “to protect our community,” after all. The J20 trial and its ominous portents do represent an escalation relative to these examples. But they’re in line with the trend of law enforcement’s steadily rising hostility toward the First Amendment rights of not just protesters, but reporters, often at the local level. Fear of homegrown American autocracy often manifests in images of an abrupt fascist takeover. But such an event is more likely to come in the form of a steady march, step by jackbooted step, toward a climate of stifling public obedience and passivity at the local level on up. And the risk of despotic rule can be seen not only in actions emanating from the highest levels of government, but also in the everyday authoritarian attitudes of, say, a neighborhood police officer, a local politician, even members of a suburban school board — or judges and prosecutors like those involved in the J20 trial and other cases, who hold private property rights supreme above all others, harbor quiet contempt for any form of public rebellion, and fetishize the importance of law and order. The jurors in the J20 trial did the right thing in resisting this slide toward authoritarianism when they acquitted the six J20 defendants today. Let’s hope future jurors in the many upcoming J20 trials, and indeed all Americans, follow their example, and not the advice of everyday authoritarians like Judge Leibovitz. An earlier version of this article mischaracterized the circumstances surrounding Judge Leibovitz’s comments during the trial of J20 protestors. The jurors in the case were not in the courtroom when she made her remarks, and thus did not hear them.